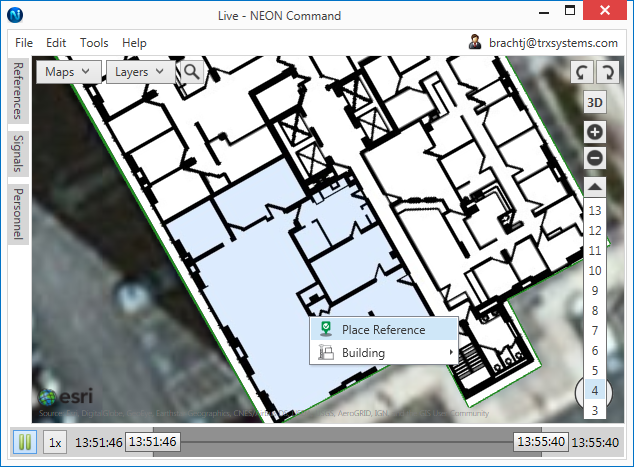 The NEON 10 update introduced many new tools to the Building Editor. These tools allow users to create different buildings of all types such as office buildings, convention centers, transit hubs, theaters, and many more. Users can now place structural features while creating their building. This can improve accuracy for Signal Mapper as well as reduce interaction when using Mapper. Below is a description of each tool available in the building editor in NEON Command. For a more in-depth explanation, please see our building editor tutorial. Building Details - Names a building, sets the number of floors above and below, and also relabel floors. Floors can be relabeled manually or set to either North American and European standards. All buildings must have a name and at least 1 floor listed as “above” which will be the primary floor. The outline of the primary floor will be used to represent the building when the building is not selected. Raise/Lower Building - Raises or lowers a building to match entrances to terrain better or lowers a building below the surface for underground buildings. Effects from this tool will be purely visual and are not necessary to improve tracking accuracy. Copy Floor Layout to Other Floors - Copies the outline and regions of the selected floor to any other floor in the building. Add Area - Creates and adds an area to the selected floor. This new area can be either connected or disconnect from the existing area. This tool is particularly useful for buildings with multiple towers. Remove Area - Removes an area from the selected floor. This tool is particularly useful to trim the outline of a building or for buildings with courtyards. Edit Layout - Translates, scales, stretches, and rotates a floor’s outline. Edit Layout Vertices - Edits the outline and regions of a floor by moving the individual vertices. Vertices can also be added and deleted with this tool. This is useful for buildings with differently shaped floors. Raise/Lower Floor - Raises or lowers a floor to represent a height that is different than normal. Effects from this tool will be purely visual and are not necessary to improve tracking accuracy. Add Floor Plan - Add a floor plan to the selected floor. The floor plan can be either a .jpg, .jpeg, .png, .bmp, or .gif file. When a floor plan is added, it will be oriented North-up by default. Edit Floor Plan - Rotates, scales, stretches, and translates the floor plan on the selected floor. Edit Floor Plan with Control Points - Aligns a floor plan on the floor by creating pairs of known corresponding points. The floor plan will stretch and scale to align with points. The building and floor plan are shown side by side for ease of use. Delete Floor Plan - Removes the floor plan from the selected floor. Copy Floor Plan to Other Floors - Copies the floor plan of the selected floor to any other floor in the building. Split Regions - Creates a region on a floor that can be measured at a different height from the rest of the floor. Users can connect features such as stairs and ramps to the region. Regions and connecting features can be used to improve tracking accuracy. Merge Regions - Merges multiple adjoining regions into a single region. This tool can be used to remove regions. Raise/Lower Regions - Raises or lowers regions to represent a height that is different than normal. Effects from this tool will be purely visual and are not necessary to improve tracking accuracy. Stairs - Places straight stair and U-shaped stairs. Straight stairs have 2 control points which can be placed on different floors or regions. U-shaped stairs have a single connector to be placed inside of a stairwell. This stairwell feature will connect all floors by default but can be edited to a select number. Elevators - Places an elevator in their building. The elevator can be rotated, scaled, stretched, and translated. By default, the elevator connects to all floors, but this can be edited to only connect to selected floors. Entrances - Places an entrance that connects their building to the terrain. Entrances have one control point that is placed inside of a building, and another control point that is placed outside. Ramps - Places a ramp between floors, regions, buildings, or terrain. Ramps have two control points which allow users to mark the top and bottom. Use choke-points. Placing an anchor at a choke-point will help to make sure users get good ranges to it as they walk past. Space out your anchors. Spacing out your anchors will help you get ranges over a larger area. Place anchors about hip level. Because we recommend that tracking units be worn on your belt or mounted to your torso, placing anchors about hip level will minimize vertical distances when ranging between anchor and tracking unit. Place anchors near a power source. If you intend to leave the anchor for an extended period of time, you can plug them in so that you don’t have to recharge them between uses. Use identifiable locations. When adding the anchor in NEON Command, you will need to know exactly where the anchor is placed. This is much easier if the anchor is placed on a recognizable floor plan feature like a corner or a doorway. Make sure the anchors are firmly placed. Once the anchor is set in place, they should not move. If an anchor is moved, NEON could solve your location incorrectly. If an anchor does need to be moved after you place it, just be sure to update its position in NEON Command. 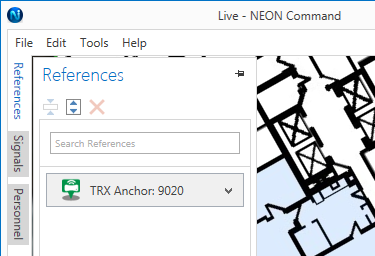 Sign into your account in NEON Command, then select the building where you will be placing the UWB anchors. In 2D mode right-click in the location where you would like to place your anchor. Be sure to be as accurate as possible. Select "Place Reference". Set the Type as “TRX Anchor” and set the ID as the serial number of the UWB Anchor you are adding. Once the anchor is added as a reference it should appear in the References sidebar. Now that your anchors are placed in the real world and in NEON Command, you are ready to track. On your Android device, open NEON Personnel Tracker and log into your subscription. If you were already logged in, you may need to sync your data to see the new references (push cloud icon at the top to sync).  Now that your device is synced, you should see your “TRX Anchor” icons on your map. Now go ahead and start up your UWB tracking unit, attach it to your belt, and go. As you walk near the UWB anchors you should see your location correct. The "Nav Lock" overlay displays 1 - 4 bars indicating the ability to maintain the current 2D location accuracy in areas without GPS or infrastructure. More bars can be obtained by walking around an area with GPS, infrastructure (BLE beacons, UWB anchors, etc. ), or by a user check-in. If the "Nav Lock" overlay displays "3D", it indicates floor level accuracy will also be maintained. In the example below, I turned on my Tracking Unit and then walked around the UWB anchors set up in the office. As I walked near the anchors, the Nav Lock Status improved. Once I reach four bars, I am fully initialized and continue to walk around the rest of the building, which has no additional infrastructure. UWB Tracking Units now support a feature that allows location data and constraints to be shared with other nearby UWB Tracking Units. This feature was designed to improve the location accuracy of groups of users tracking together. This feature is targeted for the use case where one user in a group is designated as the "navigator" and only this user enables the location sharing feature. If everyone is configured with location sharing turned on, then no one is listening and therefore there is no sharing. The "navigator" is responsible for maintaining an accurate location that can be shared with other nearby users. If the "navigator" has a poor location, it may affect the accuracy of the entire group. It is expected that all users start out with a good NEON initialization and then may proceed into an area without infrastructure (GPS, anchors, etc.). The location sharing feature helps the group to maintain better location accuracy while in an area without infrastructure. The person with location sharing turned on will use more battery because that Tracking Unit is constantly sending data over UWB. 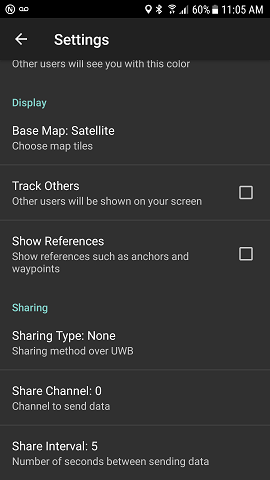 UWB location sharing can be configured using the settings page in the Personnel Tracker app. None: Manual check-ins are shared. GPS: Manual check-ins and current GPS location are shared. The channel provides for multiple groups of users in the same location to share manual check-ins, GPS or NEON locations with other users on the same channel. The sharing interval represents the how often GPS or NEON locations are shared. This setting does not affect manual check-ins.